Dhananjay Nene, a software architect, a passionate programmer, an internet enthusiast, is one of the strong, in-depth, technical voices that graces tech events in Pune, and the online/offline tech community. In spite of an MBA from IIM-A, he has remained a techie, but he uses his dual background to good advantage – amongst managers, he becomes a techie, explaining to them complexities they don’t understand or appreciate, and amongst a group of techies he starts channeling managers, to hammer some business sense into them. In the latest post on his blog (which you must subscribe to), he is pretending to be a manager who is resisting exhortations from his techies that the group should switch all development to Scala, the hot new language that is touted as a long-term replacement for Java. Note: these are not necessarily Dhananjay’s personal views – he is just trying to explain to techies all the issues that a good manager might worry about with respect to adoption of new technologies. This is a must-read for all techies, and hence, is reproduced here with permission. Why should I switch to Scala? This post is a role-play and does not reflect my individual opinion about scala accurately. I am convinced about the capabilities and features of Scala along with the fact that it deserves the mantle of a long term replacement for Java. However language adoption goes beyond technical capabilities, and this post is a speculation on what a typical manager might be dealing with when attempting to decide whether to switch to Scala. So I have been reading a lot about Scala lately and even opinions about how it will be a long term replacement for Java. I’ve also read some interesting writeups about Scala adoption such as On Scala’s Future and A Tipping Point for Scala. While I used to code a lot, my responsibilities today require me to interact with and address a lot of issues including those faced by our customers, our development teams and also engage with my peers and superiors on many other difficulties bedeviling our organisation. This gives me little time to try out Scala. I know I should be doing that, but sincerely I do not have the time. So I rely on the feedback of my team, the trade journals and other influential architects within and outside my organisation. I have heard about many developers switching from Java to Python / Ruby. However I have heard of relatively only a smaller number of large Java shops which have done the shift – most of the switch stories I’ve heard reflect a smaller sized teams. I can feel the excitement Scala has generated amongst the development teams – the brevity, the functional programming model introduction, the exciting stuff being done concurrently et al. I have no doubt that, given so much excitement it must really be a good language. To introduce my organisation – it is one of those shops which service many projects concurrently. Given the tremendous business and growth, I must confess we do not always have the luxury of being able to hire the most top notch talent. We do have a lot of projects we use Java for, and thats a language our customers are comfortable with. I’ve had some of the senior people check out Scala to gain some feedback into the language. But at this stage I must say I am inclined to evaluate the shift but not convinced enough to do so. I am sure that I could if convinced drive the change to Scala incrementally. However my fear stems from the fact that if things don’t turn out well, despite all the great advice I’ve received – its going to be my rear end on the line. So here’s some of my concerns regarding evaluating the shift to Scala and there are many of them, so some of you might be able to help me through this thought process. Functional Programming : I’m sure in many ways it rocks. But my guys tell me they are not sure how to use it in the typical bread and butter applications which read from database, do some processing and write back to the database. Does Functional Programming help me in this context ? Will my team scale into being able to write functions with no side effects assuming thats a desirable goal ? What if they tie themselves up in knots and my release to the customer is risked ? I can’t afford that. Is functional programming even desirable in such contexts ? So I am not sure if in these contexts I should just ditch functional programming and work with just normal imperative programming capabilities of Scala. I am so confused, and afraid. Sample code : Guys, I need your help. I need to see some good sample code. Some code which reflects how a typical application is architected, designed and programmed in Scala. And I don’t need it for a complex multi threaded actor based processing – I just need to see simple J2EE server based departmental applications maybe a simple recruitment tracking or library maintenance application. If I find a good one, I’ll just take it and give it to my team and say – there, thats how we’re largely going to build it, and even if we make a few changes along the way we at least have a reasonable template that we can build from. Dumbed down environment : I remember my great adventures with C and vi and make. But my team today is very different. They want great IDEs. They must have syntax highlighting, autocompletion and nice refactoring capabilities. If I ask them to move, some of them might be excited about the change and be willing to overcome these short term hurdles. But there are some of them who will not be keen to do so and may be disinclined to support such a shift. And at the end of the day my ability to conduct this shift is a function of my ability to carry a large proportion of them along with me. Even when I considered a shift from svn to git, the IDE support was a big issue even though quite obviously git capabilities were really exciting. I couldn’t push along that change, and in this case we are talking of changing the language. Is this a good time to shift to Scala ? I remember the early adopters of Java from 1996 thru 2001. While they gained a lot of experience, JRE and J2EE really matured only post JRE 1.3. Scala seems to be coming out with so many enhancements so fast, I am not sure if it has stabilised. I am told there is a 2.8 coming out in a few months. So if I train my team and Scala continues to change rapidly will I have to keep on retraining my team regularly ? And what about the customers I take to production. Will the frequent upgrades mean I end up supporting multiple customers on multiple versions of Scala ? Maybe Scala is stable but it would be helpful for someone important enough to make a clear statement that there are no new major shifts anticipated anytime soon and that these version shifts are likely to be no faster than the JRE version upgrades (which were fast enough). Support from peers and superiors : I remember the day I decided to shift to Java. What made the move easy for me was the sheer fact that Java was a big paradigm leap away from the then dominant C++. Not only was it cross platform with binary compatibility thrown in for good measure, Sun ensured that it made all the right noises to appeal to the enterprise architects and all the business managers. I see the senior developers in my team clamouring for the shift to Scala, but my peer managers and my superiors don’t display even the fraction of the enthusiasm they displayed during the Java shift. The implication for me is that the risk cover I get when I order the shift is far lesser than what I had when I made the move to Java. Which means if things don’t quite work out well, I’m really going to be screwed. Business friendliness : I understand all the nice talk about the technical excellence of Scala. But I really need to translate all these great language features into a projected ROI that I can use to convince others about. So I would like to see actual case studies of applications that were moved to Scala and what impact it had on the time and cost so that I can use it to compute my ROI. And what scares me is that learning curve may risk the initial applications long enough to push my breakeven point of shifting to Scala well beyond a 12 month and perhaps even a 24 month period. I fear things might not be as difficult but in absence of known studies, I am likely to lean towards projecting a worst case scenario rather than an optimistic one. So folks, I am asking for your help. And while a lot of you may think that people like us who balk at the thought of limited IDE support are wimps, please remember that 80% of us don’t fit into the top 20%. And if you would like Scala to be popular, you need us as much as we need you. And if you are not too sure, please remember Lisp and Smalltalk are great languages as well. ClubHack is an initiative to bring security awareness to common people who use computers and internet in their daily life. It’s a member driven open community to make cyber security a common sense. The phenomenal growth of the Internet economy has led to a sharp increase in computer crimes and hacking incidents. ClubHack aims at making technology users aware of the risks associated with cyber transactions as well as the security measures. ClubHack2009 is the third annual ClubHack conference and will revolve around technical presentations/demonstrations on topics from the world of Information Security. These presentations are expected to be of 40 minutes each. The schedule time for each presenter would be 50 minutes out of which 40 minutes are for the presentation & 10 for the question-answer sessions. This is more of an indicative list, the papers submission can be on other topics also but have to be close to this & the theme of the event. For more information about ClubHack see the PuneTech wiki page for ClubHack. Can we use technology to solve some of Pune’s problems? A few weeks ago, we had asked our readers, “How to increase community participation in the Pune tech scene?”, and we received a huge number of very interesting suggestions. Please read the comments on that article for the full list of suggestions. We have decided that over the next few weeks, we will put up individual posts highlighting some of those suggestions, and asking for feedback on how best to take this forward. Start a series on PuneTech where everyday problems (plaguing Pune) are taken and an attempt is made to address them using technology. Essentially, someone poses a problem (e.g. uncoordinated traffic lights) and puts forward an attempt at solving this problem. PuneTech community debates the feasibility and if it stands the test interested folks come together to take it further. A sponsor willing to put their name (and some moolah) behind the approved initiatives would round this off well. We are techies. Technology is our strength. So it makes sense that we try to find ways in which we can use technology to solve issues. Granted that technology isn’t always a solution to problems, but it can be a part of the solution, especially if we team up with others (non-techies) who are domain experts. Often, domain experts who are working on a problem at the grassroots are not technologically savvy, and hence are not able to leverage technology well, and a little technology boost can significantly improve the impact of their efforts. This is where we can help. What is the best method of taking this idea forward? As Unmesh indicated, we can start a series on PuneTech itself where the problems and proposed tech solutions are posed and voted upon. Or we could create a separate, more specialized package that is better at keeping track of votes (if you have good experiences with any such open source package, then let us know in the comments). 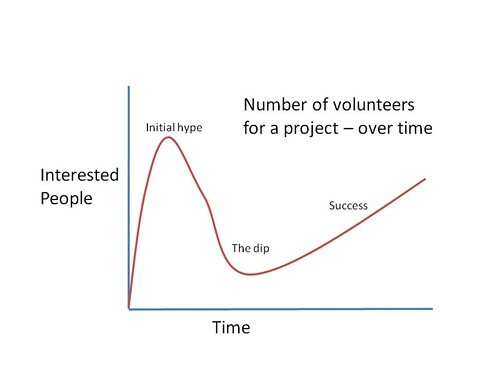 After the initial hype, where a number of people show interest, there comes “the dip” when people back out for various reasons (or just stop responding), and then only a few people are left (in some cases, just the “owner”). It is necessary that the idea owner continues working on the idea and making progress during this time, so that they can come out of the dip towards success. For that, you need to be passionate about the idea, and you should be clear that there will be a chunk of time when you are working on the idea alone. Basically, what I am saying is that you cannot depend upon “community participation”, especially in the early months. So, every project needs a passionate “owner”. Please give all your ideas, suggestions, feedback in the comments below. The IndicThreads Java conference is a technology conference that happens in Pune every year. The conference has in-depth, vendor-neutral technical sessions about a wide range of topics in the Java space. If you have done some interesting work in or related to Java, you should consider submitting a proposal. PuneTech has detailed coverage of last year’s IndicThreads Java conference. For even more details, you can see the list of speakers and the slides used in their presentations at the conference website. That should give you an idea of what this conference is about. IndicThreads.com invites submissions for the 4th IndicThreads.com Conference On Java Technology to be held on 11th and 12th December 2009 in Pune, India. The conference is the premier independent conference on Java technology in India and is the place to be, to learn the latest in the Java world while meeting with like-minded individuals from across the industry. 5. Scripting languages for Java like JRuby, Groovy, Rhino, JavaFX. Please note that marketing-oriented submissions aimed at promoting specific organizations or products will not be accepted. All sessions will be between 50-90 minutes. One / both of your proposals might be accepted. The audience consists mostly of senior developers and project leads. Before submission consider how your submission can provide best value to this target segment. Submissions will be accepted only on the website and not through emails. Please complete the entire form including the two session proposals. We will reimburse up to Rs 5000 from the air fare or the actual, whichever is less. PuneTech editorial policy – biased, and proud of it! This posts comes across as a promotion of a person more than his views/contributions or even his blog. Please be objective in future such promotions (a disclaimer, e.g. he is not paying or otherwise doing any favors to PuneTech to promote him, would also help). Peace. PuneTech is a completely non-commercial site. Nobody makes any money from this site. No favours of any kind are accepted in return for any content posted on the site. The PuneTech front page has never been, and never will be objective. We select what information appears on the front page, and we give our own opinion along with it. We feel that this makes the site (more) useful. We encourage opposing points of view in the comments – those too make the site more useful. User comments are governed by a separate comments policy. The PuneTech wiki, and the PuneTech calendar are not governed by these guidelines. Anybody is free to post anything there, as long as it is relevant to Pune and to technology. The basic idea is that we strive hard to be free of vested insterests, but we are not objective. We are not fair and balanced. In fact, we are quite unbalanced! We are opinionated, and make those opinions known. We do believe a little bit in the “if you don’t have anything nice to say, don’t say anything” philosophy. If we don’t like a particular company, or person, or technology, we simply don’t feature it on PuneTech. Unfortunately though, there are lots of companies, people, groups and technologies that we like quite a lot, but haven’t yet put up on PuneTech, simply because we lack the time to do so. That’s where you can come in. Please help PuneTech and the tech community in Pune by writing articles about interesting technology in Pune. You can write the article for PuneTech, or you can write it for your own blog and let us know, so we can publish it on PuneTech. If you publish a long, detailed article about the technology domain that your company is working in, that is of wider interest to PuneTech readers, we’ll even allow you to put in a pitch for your own company (and the kind of people you’re looking to hire) at the end of your article. That much cheating is allowed, as is explicitly mentioned in the editorial guidelines. If you have any comments, suggestions or any other feedback for us, please let us know in the comments below.